Magento 2 Point of Sale System gives the liberty to store owner to have an online store along with multiple physical stores. The physical stores will have their own POS panels for customer and sales management. Multiple sales agent can be created by the admin for each physical store. The POS system can work in both online and offline mode. The admin can create multiple physical outlets for his/her online store and associate products with them. Separate Panel for sales agent for sales management. Admin can Print Barcode Slip. Add Invoice logo from the configuration. Product Inventory division for Web and POS through configuration. Mass Inventory Assignment to the outlet / All Inventory Assignment to the outlet. Default Customer and Address assignment to the outlet. New customer can be added from the Sales agent POS panel. Easy real-time synchronization of sales and transactions. Easy centralized inventory and sales management for the admin. The products can be added to cart in three ways- on clicking the product, through SKU and through Barcode Reader. The agent can Put the POS in Full-screen mode. The POS easily operates in offline mode as well to provide better processing. Hassle-free payment and checkout process. Sales agent can hold an order for later check-out processes. Sales agent can change among multiple languages and currencies. The sales agent can view the cash drawer for computing the profit generated in a day or days by them. Sales agent can even file the return and generate cash memo for the product(s). The agent can update the product stock after the product return. The agent can refresh the whole product list and the category list. The agent can even refresh the individual products instead of refreshing the whole product list. Product support type for now- simple, virtual, configurable, downloadable, bundle and grouped. 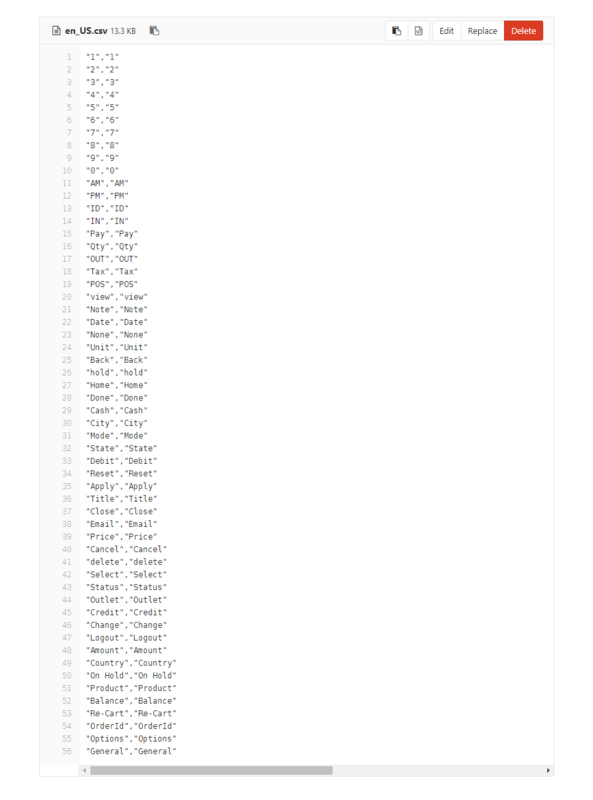 Now, run this command in the Magento 2 Root -“php bin/magento setup:di:compile” as shown below in the snapshot. Also, run this command into the Magento2 Root- “php bin/magento setup:static-content:deploy” You can refer the below screenshot. For module translation, navigate to the following path in your system app/code/Webkul/Pos/i18n/en_US.csv. Open the file named en_US.CSV for editing as shown in the below screenshot. 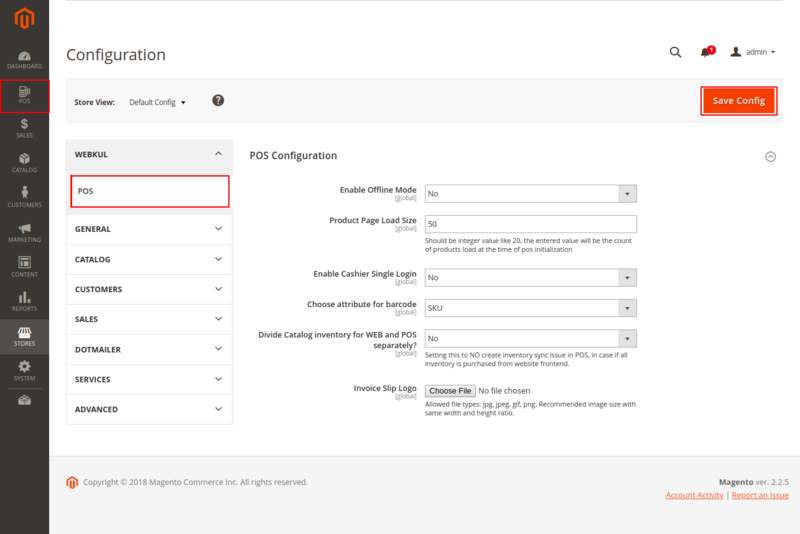 After the module installation, the admin can configure the module settings by navigating to Stores -> Configuration -> Webkul -> POS as per the below image. Enable Offline Mode- The admin can give the Cashier the privilege to do the transactions in offline mode by enabling this option. Product Page Load: set the number of products to be loaded while POS initialization. Enable Cashier Single Login: enable the cashier single login by selecting “Yes” else select “No” if want to allow the multiple logins. Choose attribute for Barcode: choose the product attribute for barcode scanning. 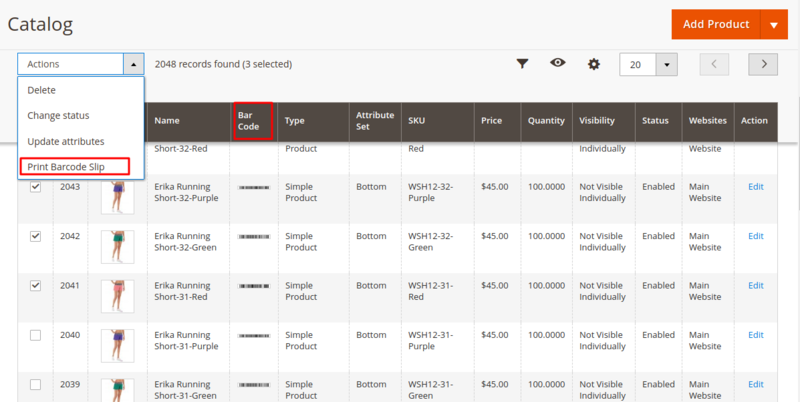 Divide Catalog inventory for WEB and POS separately: You can divide the catalog for Web and POS separately. The product inventory will be updated in the POS end along with the Web store. The product inventory will not change in the POS end. It will remain 100 but on buying product quantity above 90 from the POS end will show a error pop up message as shown below. Invoice Slip logo: Upload the logo that you want to display on your printed invoice slip. 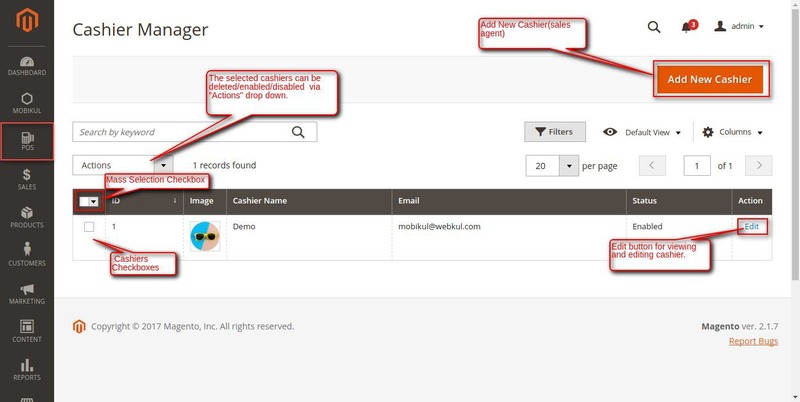 Now, the admin can manage the POS module by navigating to POS panel as per the below image. Here, the admin can view several menu options to manage the POS module. Under this section, the admin can add and manage an unlimited number of outlets. View the complete list of the outlets. Delete/Disable/Enable the selected outlets from “Actions” drop-down. Add a New Outlet to the store. Outlet Name: Enter the outlet name. Product assignment basis can be selected as – Product Based(products can be assigned individually to the outlet), Category Based,and All Products. Set Default Customer: Select Yes to set the default customer for the POS frontend. Outlet Address: Enter the address of the outlet. The address section has HTML edit option and tools. Status: Set the status of the outlet as enabled or disabled. After the above workflow, click the Save Outlet button. This shows us 2 messages to complete – To choose a default customer and to Select at least one product inventory for this outlet. To choose the default customer to navigate to Default Customer and Address section Here, search for a customer whom you want to set as default customer and select it, then select his saved address and click the Save Outlet button at the top right-hand side of the page. 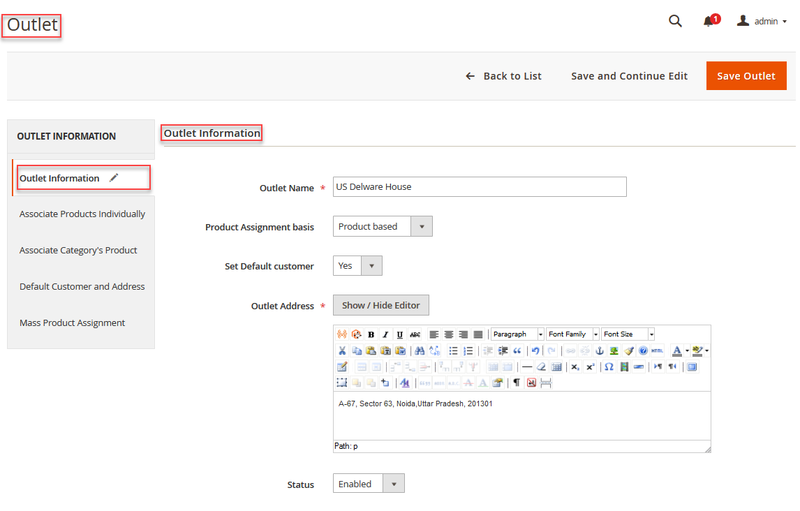 After this, to add the product inventory for the outlet navigate to Associate Products Individually menu option. Here, you can assign the products individually to this outlet when the Product Assignment basis setting is set to – Product based. lastly, click the Save Outlet button to save the outlet. Now, the procedure to add the outlet is same as defined above. But if the Category based assignment is selected then you will have to select the category/categories that you want to assign after clicking the Save Outlet button. Also, if you have set the Set Default customer to Yes then you will have to select the default customer first and after that proceed for the category selection. If set default customer option is set to Yes then you will have to add the default customer else if the default customer option is set to No there is no need to do this step and the outlet gets saved. Go to the Associate Category’s Product menu option. Select the category/categories that you want to assign to this outlet and click the Save Outlet button to save the outlet. Initially, after entering the information under the Outlet Information, when you click the Save Outlet you will have to select the default customer by navigating to the Default Customer and Address menu option(if default customer option is set to Yes else if the default customer option is set to No there is no need to do this step and the outlet gets saved). To choose the default customer to navigate to Default Customer and Address section. Here, search for a customer whom you want to set as default customer and select it, then select his saved address and click the Save Outlet button at the top right-hand side of the page. 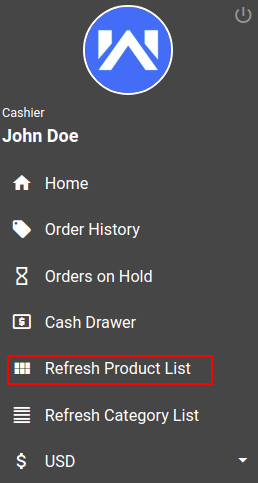 The admin can delete/enable/disable the selected cashiers from “Actions” drop-down. Mass selection checkbox for selecting all the cashiers at once for deleting/enabling/disabling cashiers. Cashier check-box for deleting/enabling/disabling cashier. Edit button for viewing/editing cashiers. Add New Cashier for adding new cashier for an outlet. The admin has to fill some fields of Cashier Information to add a new cashier. The admin can upload Image of the cashier. Full Name of the cashier. Last Name of the cashier. Email Address of the cashier. Contact No. of the cashier. Password for the cashier’s account. Confirm Password for confirming the cashier’s password. Sort Order for the cashier. The admin can choose the outlet for which the cashier account is been added. The admin can enable or disable the cashier’s account by changing its status. To view, the complete list of POS orders navigates, to POS -> POS Orders. This is the separate section to view POS orders. To view, the complete order details click View Order details. 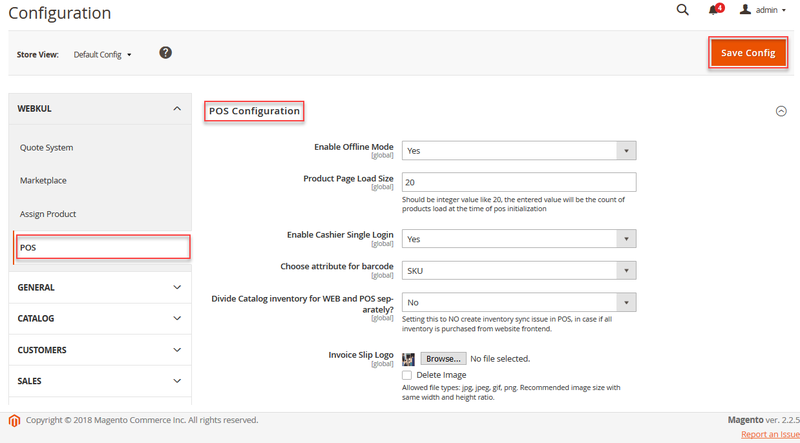 For this you need to follow these steps POS -> POS Configuration. From here also, the admin can navigate to the module configuration page as per the below image. The Barcode Slip could be printed by navigating to the Product>Catalog. On the Catalog page, the admin needs to select products for which Barcodes need to be printed. And then, from the action drop-down list select Print Barcode Slip. The user can easily Login the POS System (fronted) by using the Username (email address) and Password which is created by Admin. After the Sign-up, the Sales Agents will be redirected to their POS panel as per the below image. 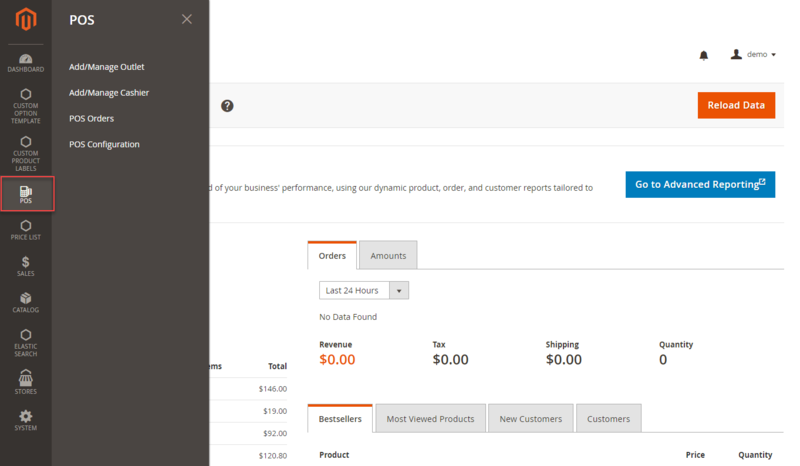 The POS panel shows all the products in the default category. The agent can change the category to view the product category wise. Sales Agent POS menus for sales management like Orders, Orders on hold, and Cash Drawer. Cart Hold icon can be used for holding a cart for later checkout or product addition. The held cart can be continued for processing by the sales agent. The cart icon shows the count of the products in the cart. Sales agent can add a product to the cart by clicking on it. The number of clicks on the product is the number of unit of the products added to the cart. Cart area has all the product with quantity detail. The sales agent can directly delete products from the cart. The Sales agent can use a barcode reader to add products to the cart by enabling Barcode Reader input via Barcode button. The sales agent can add products to the cart by product’s SKU. The Low Stock indicator on the product will indicate that the product quantity is low. The sales agent can add products via multiple methods. The products can be added by clicking on the products, by product SKU, and by a barcode reader. The sales agent can add products by clicking on the products. The number of clicks on a product is the number of units of that product added to the cart. The sales agent can view the products category wise by choosing a category from the category select drop down. The Products are shown in the cart with details like the name of the product, unit of product, price per unit and the total price of the product by adding all units price. The agent can see the subtotal and grand total price of the cart. The agent can change the quantity of a product by selecting the product and clicking on the “Quantity” button icon. The agent can give the required quantity and save it by clicking on the “Done” button. The agent can directly delete the whole cart by “Delete Cart” button. The sales agent can add products to the cart by scanning barcodes of the product through a barcode reader or by entering the SKU of the product. Please Note: The barcode reader must be attached to the sale agent system for adding the products to the cart via barcode option. Barcode icon button is for enabling the input from the barcode reader to add a product to the cart. The cashier needs to click on “Barcode/SKU” icon that will open a pop-up. In this, the cashier can either enter a barcode through a scanner or simply type the product SKU. When all the required products are added then the agent can click “Close” to disable input from the barcode reader. However, after entering the SKU the Cashier can click on “Done” to add a product to cart and then on the “Close” button to disable the pop-up. Unit of product in cart increase with number scan of a product or SKU is entered. After all the required products of a customer has been added to the cart then, the sales agent can choose/add customer for which the order has to be made. Click on Choose/Add customer icon. The sales agent can choose a customer from the registered customer list. The agent can search registered customers by name. If a customer is not registered to the store then, the agent can add the customer by clicking on “Add Customer” icon. Street Address 2 is a much detailed street address. Lastly, the agent will click “Continue” to register the customer and redirecting to the Place Order page. 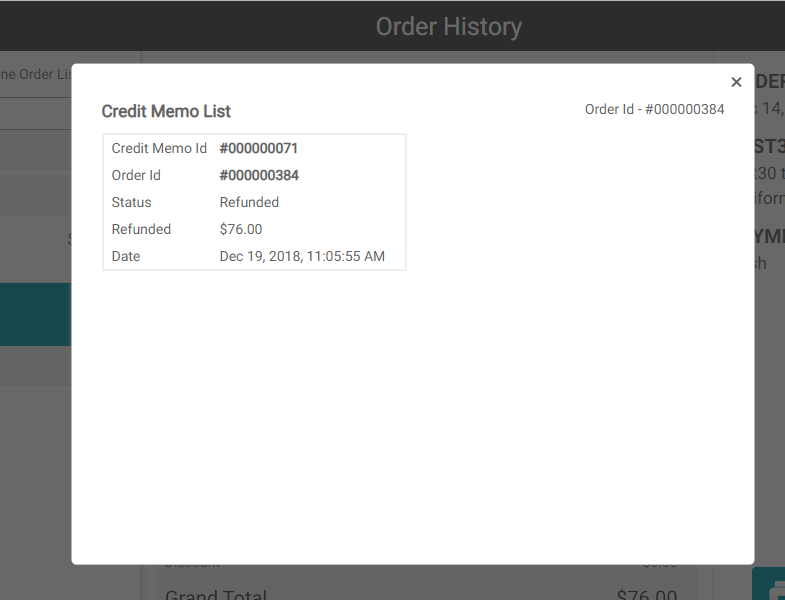 After the customer has been added to the cart for creating an order, the agent will complete the order by placing the order to generate the invoice. If the customer is not registered then, the agent will add the customer and click on “Continue” to register the customer and redirecting to the Place Order page. The place order page shows the name of the customer and the address which can be Edited that is the salesperson can choose from multiple addresses saved or add a new additional address. Amount to pay is the total amount of products in the cart, Amount paid is the amount paid against the total amount. The Extra amount is the amount which needs to be returned by the salesperson as a change. Address of the customer can be chosen and saved by the “Done” button. The sales agent can change/add an address of the customer by clicking on the Edit button. On clicking “Add New“, the customer add page will open. Change the address and continue to place the order with a new address. Select the payment method available. The sales agent can allow its customer to split the payment between card and cash by split payment option. This option is meant for dividing the payment amount into bits as the customer can pay some amount in cash and some amount as the card. Lastly, the agent will click on Place Order to place the order and generate the invoice. The agent can print the invoice or move to the next order. The admin can enable discount in the back-end as a price rule which will be applied at the time of checkout. The sales agent can put the cart-on hold for the later processes and can continue to process on the held cart when required. The agent can put a cart-on hold by clicking on “Put cart on hold” icon placed on the right side of the full-screen button. On clicking cart on hold button, the salesperson will get a pop-up that will be asking about a custom note for the particular order. This note is meant to recognize the order when there is a long queue of customers. The agent can navigate to the “Order on Hold” through POS menu icon -> Order on Hold. After Clicking on the Order on Hold tab the agent will be redirected to the orders on hold. The agent can Re-cart the held order to continue the further processes. The agent can Remove Cart from the held order list. The agent can check the orders by navigating through the POS menu -> Orders. List of the orders including online and offline orders. The orders can be returned by clicking the Return button on the order placed. The cashier can select the products which need to be returned by the customer and then click on “Done” and finalize the Return. Note- Return process can be accomplished in only online mode. The salesperson can click on a credit memo button to view the credit memo. The cashier can even process a transaction in offline mode, this is a beneficial feature for the areas where internet connectivity is weak. 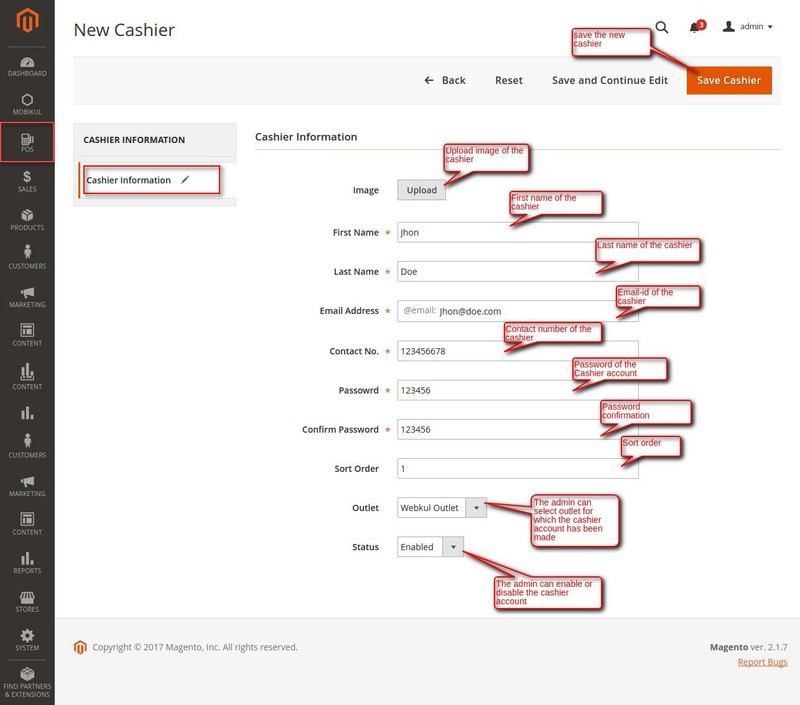 The cashier can view all the transactions processed in offline mode by following the navigation POS menu> Order History. After this, the cashier can view all the offline orders which can get auto-sync or the cashier can individually sync the order for Sync Order button which will add this to the list of orders. As the Sales Agent Sign in, he checks the cash amount in his Cash Drawer. After checking, the amount is submitted initially just after the Sign in. The Credit amount is the amount taken by the agent from the customer against the payable amount of an order. 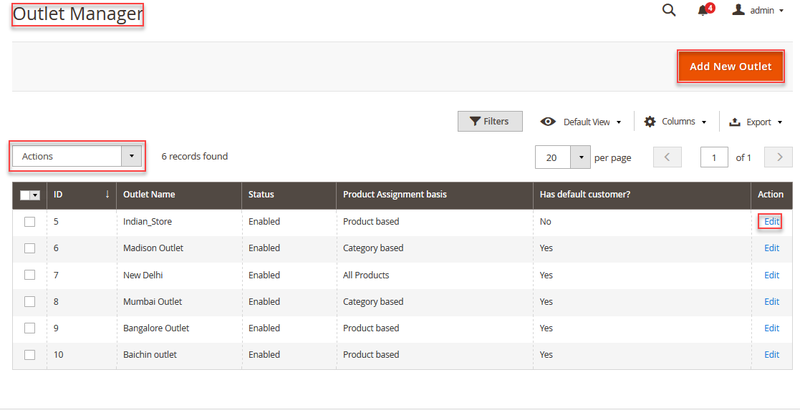 This helps in refreshing the product list, any changes done by admin in the backend is reflected on the frontend. Note: The agent can even refresh the individual products. This helps in refreshing the category list, any changes done by admin in the back-end is reflected on the front-end. The salesperson can change the currency according to the requirements, by clicking on the Menu tab the salesperson can select among currencies available. For information related on purchasing the application, you can just email us at support@webkul.com and can ask your requirements there. 1. The Magento POS connects only to the Printer, and barcode reader, whereas it doesn’t connect directly with the cash drawer and card swapping machine. -> So when we choose POS pay as credit card, there is no connection with swapping machine and we have to manually handle the payment process such as enter total mount, it is right? -> If I choose yes, all inventory will be synced between POS and Magento. If I choose NO, the main inventory is still on Magento, no inventory synced, it is right? 3. I do not see the full outlet setting s(http://prntscr.com/l6n9ei), from the demo (http://prntscr.com/l6na0q). Which one will be the newest version when we use it? 4. 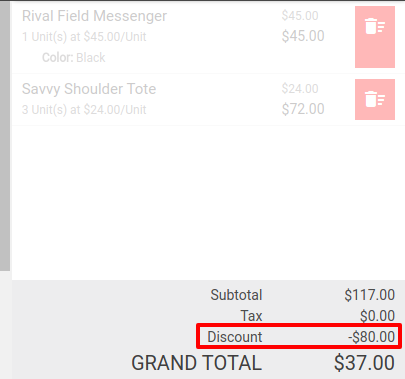 Where I can set discount rules for POS? By cash or By Credit/Debit card. Then separately on the card swapping machine you have to enter the product total & after the successful transaction, the outlet cashier can provide the invoice to the customer which is generated. – Yes, if you chose the option as ” No ” then the whole inventory will be for website only. – https://prnt.sc/mdp43k You can find the screenshot of newest version in this link. -The admin can enable discount in the back-end as a price rule which will be applied at the time of checkout.